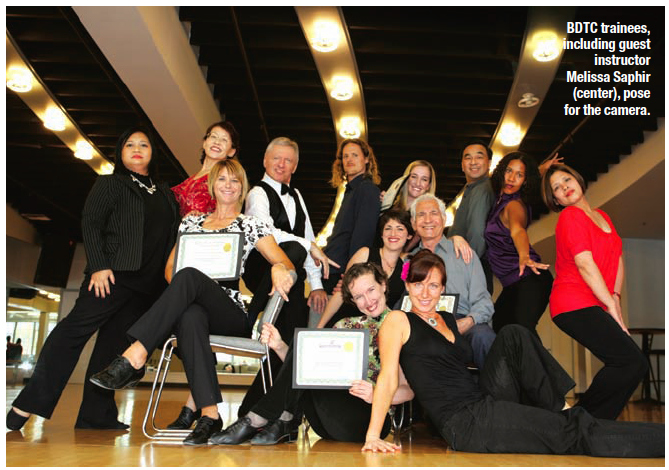 When Diane Jarmolow, former owner and director of San Francisco’s Metronome Ballroom (one of the largest and most successful ballroom dance studios in the country, now a Cheryl Burke Dance studio), founded The Ballroom Dance Teachers College program in 1991, there was no vocational training available for ballroom dance teachers. Now, BDTC has built a template for dance teacher education that has served as a model for 40 programs throughout the United States, Canada, India and the Caribbean. “I don’t want anyone looking back on their life and thinking, ‘I had an OK career, but more than anything, I wish I could have danced,'” says Jarmolow. And dance they do. Participants in the 16-month BDTC training program learn a massive vocabulary of ballroom styles: Argentine tango, bolero, cha cha, East and West Coast swing, foxtrot, hustle, lindy hop, merengue, mambo, nightclub two-step, rumba, salsa, samba, tango, Viennese waltz and traditional waltz. BDTC master teachers are trained in various disciplines and bring those skills to the classroom as well — for example, guest instructor Julie Lowe is a former principal ballerina with the Oakland Ballet. Each two-hour class typically begins with a homework presentation that analyzes various aspects of dance elements, such as understanding the open break and underarm turn in the rumba, or the follower’s role as opposed to the leader’s in the basic tango curving move. Teachers give feedback and review previous lessons before introducing new elements, such as foot and dance positions, alignment, rise and fall, amount of turn and footwork, among others. Participants will also gain important teaching skills, like vocal projection,selecting appropriate class music, rotating partners, selling dance lessons and communicating with customers. Lee Erica Elder is a freelance writer in New York City.